Luminette custom window covering sheers feature translucent fabric with soft fabric vanes that rotate for convenient light control and privacy. 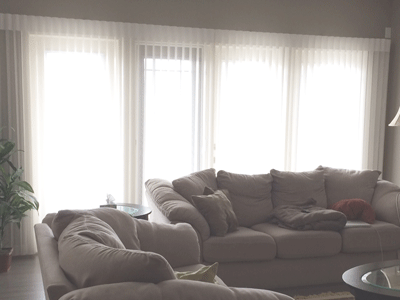 These custom window covering sheers are vertical blinds that are especially suited for entire walls of windows, patio or French doors. Privacy sheers provide the widest range of light control possible, with a sheer face fabric to let the light in and an attached soft fabric vanes that rotate to keep the light out. The exclusive Hardware System which is standard, is easy to operate, with proven reliability. When the sheer drapery is drawn closed, the hardware components are concealed by the fabric. Hunter Douglas Counterparts is a coordination program which offers color coordination between Luminette Sheers and Silhouette Window Shadings. It is available in select fabrics and colors. Learn more about Luminette Privacy Sheers.